CWAers' hard work across the country to raise concerns about the proposed T-Mobile/Sprint merger with their elected officials is paying off! Last week, U.S. Senators Edward J. Markey (D-Mass. ), Amy Klobuchar (D-Minn.), Tom Udall (D-N.M.), Tammy Baldwin (D-Wisc. ), and Richard Blumenthal (D-Conn.), all members of the Commerce, Science, and Transportation Committee, called on Chairman Roger Wicker (R- Miss.) and Ranking Member Maria Cantwell (D-Wash.) to schedule a Senate hearing on the proposed T-Mobile/Sprint merger. A hearing in the House of Representatives is scheduled for February 13. "The potential consequences of this merger are too great for the Senate Commerce, Science, and Transportation Committee to ignore," wrote the Senators. "We should examine the impact of combining these two disruptors into one mega company." 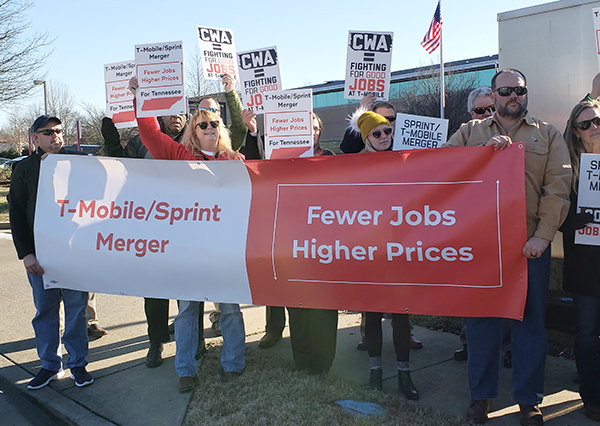 Also last week, workers and local community leaders held a press conference outside a T-Mobile call center in Nashville, Tenn., to highlight how the proposed T-Mobile/Sprint merger would harm Tennessee workers and consumers. According to a detailed CWA analysis, the T-Mobile/Sprint merger would result in 126 store closures in Tennessee, eliminating hundreds of jobs. The merger would mean increased prices for consumers – especially low-income and senior residents of the state. The proposed merger also would threaten call center jobs, as T-Mobile currently operates call centers in Chattanooga and Nashville, employing approximately 850 workers. CWA analysis of the merger shows that it would result in the loss of approximately 30,000 jobs across the country – 25,500 job cuts from the elimination of duplicate retail stores and another 4,500 job cuts due to duplicate headquarters functions. CWA has launched a website with information about the effects of the merger, including detailed state-by-state information about job loss. You can also stay up to date by following @TMSprintFacts on Twitter. Workers and local community leaders held a press conference outside a T-Mobile call center in Nashville, Tenn., to highlight how the proposed T-Mobile/Sprint merger would harm Tennessee workers and consumers.